Now two games into the preseason, Detroit Red Wings management continues to evaluate players with the hopes of putting a winning—and Stanley Cup contending—team on the ice. And while the injuries to Pavel Datsyuk and Darren Helm postpone Jeff Blashill’s ideal lineup, it does come with a silver lining. Blashill now has the chance to evaluate prospects in real-game situations if he chooses. Players who would have likely been assigned to juniors or Grand Rapids now have the opportunity to earn playing time against the world’s best hockey players. Let’s take a look at who could earn a few games with the big-league team and force difficult roster decisions down the road. What? You were expecting Dylan Larkin? Anthony Mantha has had a very solid camp and preseason thus far. He’s consistently been putting the biscuit in the basket for the Red Wings and could earn a game or two on the third line if Blashill wanted to have Luke Glendening center the fourth line and sit either Joakim Andersson or Landon Ferraro. A quick promotion to Motown would be a nice reward for hard work after a roller coaster first year with the organization. 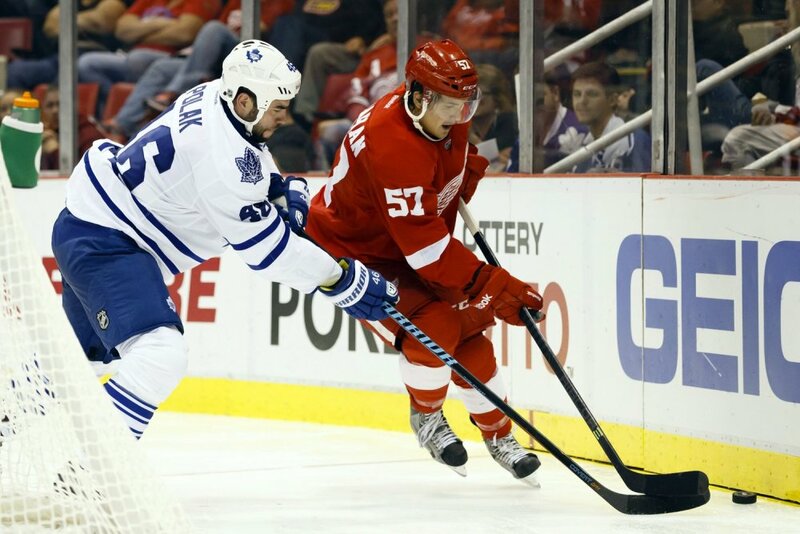 Like Mantha, Larkin has impressed thus far and drawn praise from his teammates. Jimmy Howard commented that Larkin has nowhere to go, but up. “The sky’s the limit for him,” he said. If Larkin does get a chance to play for the Red Wings at the start of the season, it may have to be on the wing, as opposed to his traditional center role. With Glendening, Andersson, Henrik Zetterberg, Brad Richards and Riley Sheahan already on the roster, Larkin may be best suited on the wing, learning the game at NHL speed. In the Red Wings’ second preseason game against the Blackhawks, Callahan was a spark plug on the ice. He projects to be a bottom-six grinder with a little bit of offensive upside, but his well-rounded game could earn Callahan some playing time. His work on the penalty kill and ability to get under opponents’ skin could add a new element to the Red Wings’ lineup. You must be doing something right when you get under agitator Andrew Shaw’s skin, steal the puck, and lead a 2-on-1 rush, all while on the penalty kill. Brendan Smith and Jakub Kindl are competing with one another for playing time with Kyle Quincey on the bottom defensive pairing, but Alexey Marchenko could up-end both of them with solid play this preseason. Smith continues to make boneheaded plays for every stride forward he takes and Kindl has not been overly impressive so far. Marchenko has a great first pass, can play the penalty kill, and has a rare right-handed shot. He could find his way into the lineup alongside Quincey while the Red Wings have the roster space to carry eight defensemen.